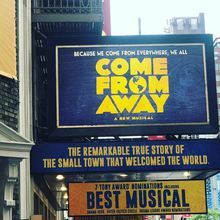 Ciwt was lucky enough to get to Come From Away in New York this fall and then again yesterday in San Francisco. She liked it very much in both cities. It starts kind of like a college review or talent show but gets deeper and deeper as the threads of the story begain weaving together and becomes a heartwarming, dare Ciwt say fun?, musical about September 9/11. Impossible to believe, but true.